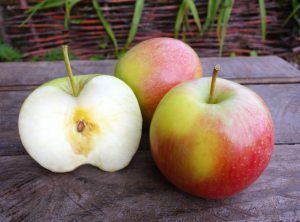 Big, sweet, crisp, gold-with-a-red-blush, Jonagolds are the most delightful fall apple in the orchard. If you are a sweet apple lover, this apple is what you have been looking for. They make terrific sauce, a wonderful addition to a mixed-apple pie, and a sizable snack. Pro-tip: Although these wonders are a gold apple, pick them with a little blush on them for the most juicy flavor.